It all starts with our extraordinary leathers from France and Italy. Most of our pieces are crafted with full grain calfskin leather, known for its beautiful quality and original surface which often reveals natural markings and color or grain variations. These characteristics guarantee its authenticity and make each piece distinctly unique. We believe that responsible sourcing and transparency is vital to our well-being and to our business. In line with this ethos, we carefully evaluate the origin and manufacturing of our leather. We partner with tanneries that guarantee traceability and processes that are respectful of the environment and communities. These tanneries are compliant with REACH regulations (Registration, Evaluation, Authorization and Restriction of Chemicals) in Europe, and are processed free of nitrogen or heavy metals. The result: authentic, traceable, non-allergenic leather that has a soft, pleasant and delicate feel. 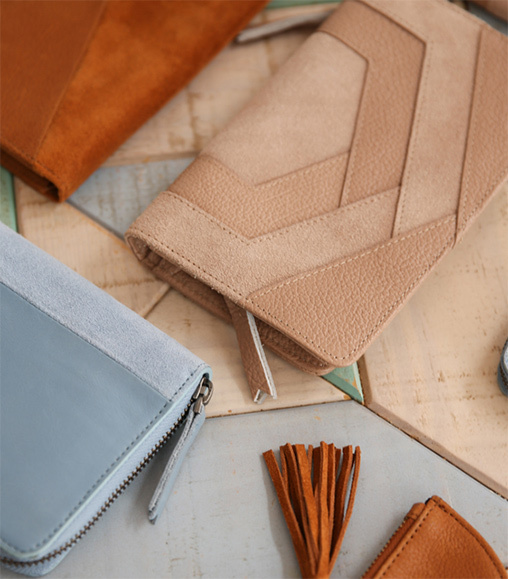 We love bringing new colors and textures to our leather handbags and accessories. We achieve this by responsibly sourcing different kinds of leather and “split-leathers” which lend depth and variety to the look and feel of our bags. This is the strongest and most durable leather, embossed to achieve specific designs, grains or scales. Over time, full-grain leather is imbued with a distinct patina from being handled, giving it warmth and character. Oil tanned leather is unique for its special oils and waxes applied during the tanning process to give it a smooth, supple, and silk-soft feel. This leather takes on a delicate patina over time, revealing a depth of shine and beauty. Wax nubuck leather has been lightly buffed to create a velvety surface that’s soft to the touch. Some have a lighter or heavier grain, with a variety of depth in color. 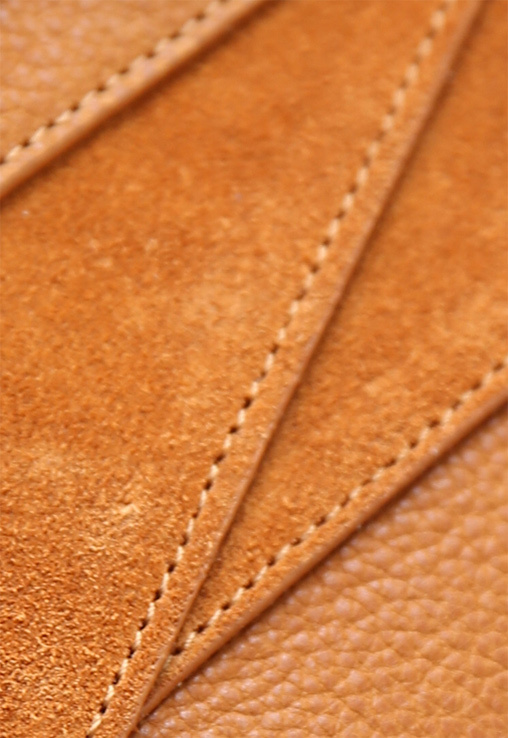 Nubuck leather can scratch easily or be sensitive to water, so please care for your leather. Suede Leather has an altered thickness that creates a speckled texture we like to call “the sparkle effect.” We use suede leather when we’re looking to add of radiance. With age, leather develops a natural patina, or shine, that lends a soft look and feel to leather. It’s smooth, slightly shiny, with an elegant, vintage vibe. When used with care, this leather handles every season without a wrinkle. Vegetal leather is an organic form of tanning that uses a blend of bark extracts, sap and organic dyes. The result is a firmer, thicker leather with a smoothness and minimalism we love for its vintage-chic look. Leather is a natural, living material that requires a sensitive touch. It can be prematurely damaged if not cared for properly. Over time, your leather will change and develop a patina: this natural wear takes the form of color and texture variations that give leather its character and enhance its authenticity. Here’s how you can prolong the life of your bag. Before the first use, we recommended using a colorless waterproof spray. First test, the spray on a small, non-visible part of the bag. Then, mist the spray from at least a foot away to avoid staining or damaging the leather. If the leather has been rained on, leave it to dry and it will absorb the water naturally (do not put the leather on a radiator or near any source of heat). You can repeat this waterproofing process every 2-3 months. Note: avoid waterproofing vegetal tanned leather, as this can cause irreversible staining. Try to avoid prolonged exposure to water, sun or extreme heat, as this can significantly and prematurely alter its appearance. To prevent any discoloration or stains, take extra care to protect your leather during extreme temperatures or weather. When not being used regularly, store your bag in its protective cover, away from light and moisture, in a clean, dry and ventilated place. If you do not use it for an extended period of time, make sure you take it out and air it from time to time and polish it, either with a clean, soft cloth or with a special nubuck leather brush. This prevents dust from becoming embedded in the grain of the leather. Stains must be treated very quickly to prevent it from sinking into the coating of the leather. If you react quickly you can limit any damage.